Total Laser uses alexandrite laser, one of the most acclaimed ways to achieve hair reduction and suitable for all skin types. 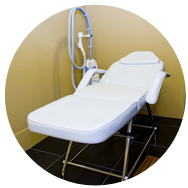 It is one of aesthetic medical treatments currently most popular among women. Whether for aesthetics reasons, to maintain a higher personal hygiene or to end the cystic hair. It is done for reasons of hygiene, to avoid perspiration and excessive heat, to prevent the formation of spots and cysts, for aesthetic reasons and to avoid areas of friction irritation. We will personally solve your doubts, you can check the effectiveness of the laser and see how we work before you decide.